Lt.-Col. Charles Doland Crisp, O.B.E. Amon Wilds (1762-1833) and his son Amon Henry (1784-1857) were entrepreneurial builders and architects, whose careers spanned from 1790 to 1855. Amon began the business in Lewes. Father and son moved to Brighton in 1817 when the resort was expanding rapidly and already far ahead of other resorts in scale and social status. Its growth attracted well-connected London architects who competed against each other as well as against provincial architects such as the Wilds. Seen in this competitive context, the self-taught Wilds were remarkably successful. Many of their buildings stand today, including the replacement nave of All Saints church, Friars Walk. I started researching the history of Lewes Racecourse back in 2007. After spending a lot of time up at the course they call the horseshoe, I have now discovered what a big part race days played in the life of the town. I have been collecting memorabilia – a lot donated to me, but some I had to spend money on – and now have in my possession thousands of reports going back to 1727. I have just finished listing the names of 27,000 horses that took part in the races between 1727 and 1964, and also all the names of the winning owners, trainers and jockeys. This information will be bound in leather binders by Hannah of Highdown Bindery, Lewes. Charlie Palmer Models in North Street will shortly be starting work to construct a model of the Lewes Racecourse as it used to be when in use, and both the books and the model will be donated to a Lewes museum. Charlie Palmer would like to hear from anyone who might have information that might help him with the model, such as photographs or even information about the colours of the buildings. Lewes Racing Past does not currently have a website, but you can contact me at 01825 761727 or by email at beejaysfencing@aol.com. After reading your interesting article about the artist Thomas Henwood, I found from the Sussex Family History Group records that his children George Felix, Edward Augustus and Harriet Mary Anne were all baptised on 17 August 1829 at St John-sub-Castro. I didn’t find baptisms for Ellen or Thomas James. His daughter-in-law Isabella Henwood of High Street was buried at St Michael’s on 26 September 1892, aged 44. 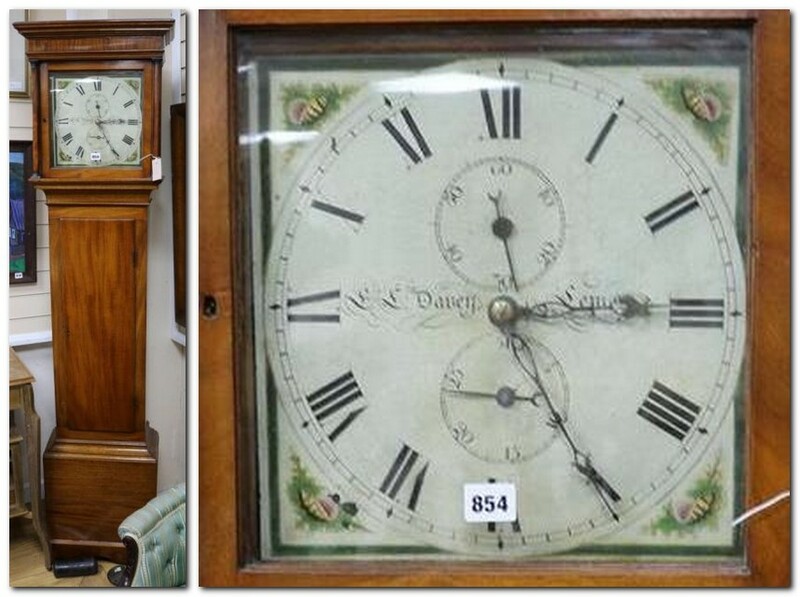 Offered for sale at a Gorringe’s weekly auction in January 2019 was an early 19th century thirty hour longcase clock by Davey of Lewes, estimated at £180-£220. The elaborate script on the dial appears to give the clockmaker’s name as E.L. Davey. The British Museum website offers as a candidate Ebenezer Lovell Davey, who in the mid-19th century traded as Davey & Sons, Lewes, clock and watchmakers, together with his sons Thomas (born 1811) and George (born 1818). Ebenezer Lovell Davey was buried at Lewes All Saints on 27 December 1861. His age was given as 80. The 1851 census gives his age as 69 (confirming he was born about 1781), and his birthplace as Lewes. In October 1796 he was apprenticed for 7 years at a premium of £30 to William Cozens, a watch finisher, of St James, Clerkenwell, Middlesex. On completing his apprenticeship he set up in business in Lewes, and is recorded in the land tax as both owner and occupier of 47 High Street, at the top of School Hill, from 1802-1806. He appears as ‘Davy, watchmaker’ in John V. Button ‘The Brighton and Lewes Guide’ (1805). In February 1812 E. Davey, watch and clock maker, advertised in the Sussex Weekly Advertiser that he had moved from opposite the Star Inn to a shop near near Cliffe Bridge. He is not specifically recorded at any address near the bridge, but it is tempting to suggest he may have been at 1 Cliffe High Street, occupied by the cutler Joseph English until 1806 but after 1810 described as ‘late English’s’. 1 Cliffe High Street was occupied by other watchmakers and jewellers, latterly W.E. Clark, from 1824 until the 21st century. A few years later he suffered insolvency, a common business hazard at the time, and was one of 17 inmates in Horsham Gaol to advertise in the 10 January 1814 Sussex Weekly Advertiser “that as they have not been charged with any debt exceeding the sum of £2,000 [they] give notice that they intend taking advantage of ‘An Act for the Relief of Certain Insolvent Debtors in England’.” He was described as formerly of Charlton Street, Somers Town, Middlesex, but late of Lewes, watchmaker. It isn’t clear how quickly he was able to resume business in Lewes, but his son George Middleton Davey, born about 1818, gave his birthplace as Lewes in later censuses. Ebenezer Davey, watchmaker, appears in the Lewes section of Pigot’s 1823 Sussex directory. By 1825 he was established at 193 High Street (at Aylwards Corner near the War Memorial). An item in the 16 May 1825 Sussex Weekly Advertiser confirms that he was living in this part of the High Street. It reports: “About noon on Thursday, a partridge, to escape the pursuit of a hawk, no doubt, flew into this town, and against the parlour window of Mr Keating’s house, adjoining the Crown Inn, and broke two squares of the glass, from which it dropped to the pavement and ran into the shop of Mr Davey, watchmaker and was taken alive behind the counter. It proved to be a very fine bird.” He attempted to vote in the 1826 election, but the poll book records that his vote was rejected. 193 High Street had been built about 1790 by the gunsmith Abraham Weston and was known as The Original Gun Manufactory’. In the 1841 census Ebenezer Davey lived on High Street in Lewes All Saints with an Ann Davey aged 60 (probably his wife), his sons Thomas and George Davey and a teenage servant girl. There is an April 1845 burial for Ann Davey aged 66 at Lewes All Saints. The Davey family were still at 193 High Street in 1851, when Ebenezer L. Davey (aged 69 and now a widower) and his two unmarried sons Thomas (40) and George (33) were all described as watchmakers and jewellers. They had a female servant to look after them. They had moved by 1855, when 193 High Street was occupied by a hosier and haberdasher, but they had not moved far. Ebenezer Davey appears to have retired, but in both the 1862 and 1867 Kelly’s Directories George Middleton Davey and Thomas Davey, were next door but one at 195 High Street, described as watch and clock makers, silversmiths, jewellers and dentists. George Middleton Davey was listed separately as a surgeon dentist, and from 1861-1868 advertised as a surgeon and mechanical dentist at the Lewes Dispensary and 195 High Street, Lewes. He also advertised some clinics at Seaside, Eastbourne, and that he held a certificate from Guys Hospital. The combination is surprising to modern eyes but watchmakers were skilled at precision work and had experience of working with the right materials. As noted above Ebenezer Lowell Davey was buried at Lewes All Saints in 1861. His son George Middleton Davey was buried there too, in April 1868 aged 50. Described at his death as a surgeon dentist and silversmith, his estate was still being wound up in 1872, when the London Gazette names as one of his executors his widow Jane Maria Davey, who had by then also died. He also had a son, George Middleton Davey junior, born in 1864 and brought up by a guardian, who became a Surrey solicitor. Thomas Davey did not continue the business on his own. By 1871 the watchmaker Henry Adkins was at 195 High Street, and he in turn was succeeded by another watchmaker, A.H. Kirk. Sources: British Museum, Familysearch and British Newspaper Archive websites; D Moore, ‘British Clockmakers and Watchmakers Apprentice Records 1710-1810’, Mayfield Books; Colin Brent, Lewes House Histories. Source: J.V. Button, ‘The Brighton and Lewes Guide’, printed and published by J. Baxter in 1805. In the same year John V. Button published a volume of poetry, ‘Exercises in Elocution, or Poems Select and Original, principally intended for public recitation’, also published by Baxter. John Viney Button (c.1786-1872) was a son of the proprietor of the Classical and Commercial Academy, Cliffe High Street, Lewes, and was still a teenager when this guidebook was published. As noted in Bulletin no.98 he was awarded the town’s Steere Exhibition in 1807 to attend Queen’s College, Cambridge, and after graduating became a clergyman. The old Sessions House in the middle of the High Street is pictured in Bulletins nos.7 & 71. It was removed in 1812. Charles Doland Crisp was chosen Mayor of the Borough of Lewes on eleven occasions – more than anyone else. He was elected to this post in 1923-1925, 1938-1944 (so in office right through World War II) and finally in 1949. When he retired as Mayor in 1950 he was in his mid-eighties. He was a Conservative councillor who also represented Lewes on East Sussex County Council for many years following his first election in 1925. Who was this remarkable public servant, remembered today primarily by a road named after him on the Borough Council’s Landport estate? A basic biography is available. He was born in Hammersmith on 18 February 1864. His father, also called Charles Crisp, was a piano tuner. He had an elder and a younger sister. He followed the example of his elder sister, and trained as a teacher at the Anglican Culham College in Oxfordshire. In 1886 he married Alice Kemp, a Whitstable oyster merchant’s daughter, whose brother was also a teacher, and they had a daughter and a son born in 1887 & 1889. In the 1891 census he was a certificated school master at Shere in Surrey, where he was headmaster. By 1901 he had changed his career to become a superintendent in a life insurance office. He joined the Norwich Union in 1906 and worked for them for the rest of his working life, retiring as a director on New Year’s Eve 1937. He returned to London, living at Melrose Gardens, Hammersmith, in 1901-2, Wexford Road, Clapham, from 1903-1905 and Whitehall Park, Islington, 1909-1912. His son served as a Royal Navy officer before, during and after the Great War, attaining the rank of Lieutenant Commander. Charles Doland Crisp was 50 when the war broke out, but nevertheless served first in the Royal Naval Volunteer Reserve and later in the army, rising rapidly through the ranks to become a Lieutenant-Colonel and deputy commandant of the cadets in the County of London Territorial Force. In recognition of this work he was awarded an O.B.E. in 1920. In 1920 Lt-Col Crisp and his family moved to Lewes, with their home at ‘Franche’, 2 De Warenne Road. He lived there until his death. He was elected to the Borough Council in 1921 to and the County Council in 1925. As mayor he became a local magistrate. His wife Alice died in January 1935, after which his married daughter served as his Mayoress. He was in his late seventies by the start of World War II, but in addition to serving as mayor he also acted as Town Clerk and sub-controller for the Lewes A.R.P. wardens. He was said to have been on duty for every one of the town’s 1,051 air raid alerts. In 1940 he was made a Freeman of the Borough. The Duke of Norfolk chaired a public dinner given to mark his 90th birthday. He died in 1956, a few days before his 92nd birthday. However, this impressive career is only one aspect of Charles Doland Crisp’s life. He was an active freemason but his passion was for sport, in particular football. In his youth he embraced a number of sports, playing in goal as an amateur first for Oxfordshire and then for the London Hotspur team. He was also played cricket, golf and tennis, swam, was a good middleweight boxer and ran the 100 and 200 yards for Ranelagh Harriers. In the 1940s he chaired the Sussex branch of the Amateur Athletics Association and in later life he took up bowls. He also became deeply involved in the organisation of football as it became more professional. He was a founder-member of the football referees union in 1908, becoming its London regional organiser and serving as an official at the London Olympic Games football tournament in 1908. He was chairman of the Middlesex Football Association for several decades, before and after he moved to Lewes. He was the Middlesex F.A. representative to the national F.A., where he served on the disciplinary and refereeing committees, and on the committee that revised the game’s rules. In 1912 he helped establish the Athenian League, for amateur football clubs in the London area. In 1913 he became the first new director of the Arsenal F.C. after they moved to Highbury stadium and remained in that role for more than a decade. He resigned after a disagreement with the chairman (who had made his chauffeur a member of the Arsenal ground staff). He transferred his allegiance to Chelsea F.C., where he was a director through the 1930s and became chairman. He resigned from the Chelsea board in 1940, to focus on his wartime duties in Lewes. He was also involved in the development of football in other European countries, especially Belgium. Later in life he was a director of the Lewes Wanderers and president of the East Sussex League. He was much in demand as a speaker and writer on football topics, owning his own sports newspaper at one period. In 1923 he gave a talk entitled ‘Humours of Football’ on BBC Radio, the first recorded broadcast BBC feature on football. He contributed football columns to several newspapers including the Sussex Express. In Lewes History Bulletin no.103 the artist Thomas Henwood was identified as having lived at 13 Keere Street, but I believe that he lived at number 12, which is where I live today. Entry 107 of the original record of the 1851 census clearly shows Thomas Henwood (1797-1861) living as head of household at 12 Keere Street, and the sequence of the Keere Street entries fits with this. The entry describes him as an artist (portraiture of persons and animals) and shows him living there with his wife Ellen, his son Edward, a printer, his son George, a professor of music, and another son Edwin (see attached copy of census). Research done by a descendant of Thomas Henwood, his great-great-granddaughter Marie L. Daniels, reached the same conclusion. Thomas Henwood’s works are now held in places such as the National Portrait Gallery, the Science Museum, Lords Cricket Ground, Lewes Castle Museum, Anne of Cleves House and the mayor’s office at the Town Hall, Lewes. His standing as a Sussex artist at the time is clear from the extensive use made of him by the county gentry and landowners of that county, not just to paint themselves and their prized animals, but also to draw their country homes and estates. Some thirty pictures by Thomas Henwood feature in the 2 volume work by Rev Thomas Walker Horsfield entitled ‘The History, Antiquities and Topography of the County of Sussex’ (1835). Although Horsfield was based for a period at Westgate Chapel, Lewes, he had moved to Somerset before the completion of this work and relied on his printers, Baxters of Lewes, to source materials direct from the relevant landowners. As he states in his preface dated 29 September 1834, “The numerous elegant engravings with which these volumes are embellished are, for the most part, presented by the Nobility and Gentry of the county.” Indeed most of the plates name the donor. Volume I of Horsfield’s work features a portrait of Henry Nevill, 2nd Earl of Abergavenny, KT, MA inside the front cover. This picture was drawn by Thomas Henwood and engraved by Edward Scriven and is held at the National Portrait Gallery. Henry Nevill was one of the lords of the manor of Lewes, MP first for Seaford and then for Monmouthshire, a Recorder of Harwich and a Knight of the Thistle. He was said by Horsfield to trace his family back to Gilbert de Nevill, a Norman chieftain and admiral to William the Conqueror. Although he owned extensive property in Lewes and elsewhere, his principle family seat was at Eridge, where he rebuilt the house. Thomas Henwood’s picture of Eridge Castle also features in Volume I. Inside the front of Volume I is a map of East Sussex with views from the sea of coastal towns, also drawn by Thomas Henwood. 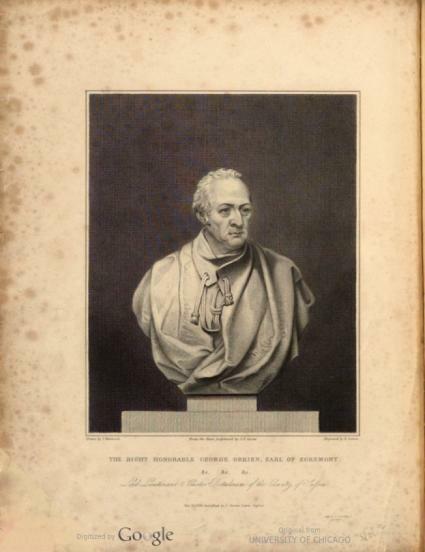 Volume II of Horsfield’s work features a picture by Henwood of the bust of the Earl of Egremont inside the front cover. He was the owner of Petworth House, which contains a remarkable array of significant artwork collected over the years. A picture by Thomas Henwood of Petworth House also features in this volume. Similarly the map inside the front cover of West Sussex has drawings by Henwood of views from the sea of coastal towns. Thomas Henwood also drew and painted significant local events contemporaneously, thereby creating a detailed snapshot of local history for posterity. His painting ‘The Procession of the Bonfire Boys, November 5th 1853’ is used today in one of the banners that parade every year. It has also been used on the front cover of the 2017 Ye Olde Lewes Borough Bonfire Society’s programme. The original oil on canvas painting is held at Anne of Cleves House in Lewes. A large coloured lithograph of the image can be found hanging in the Freemasons Hall. Neither the High Street appearing in the picture nor the nature, colour and vibrancy of the procession have changed much since 1853. A coloured engraving of ‘The Visit of William and Adelaide to Lewes, 1830’ hangs in the Mayor’s office at the town hall. Henwood’s coloured lithograph, ‘The Ascent by Balloon of Mr. Green and W.H. Gardiner from Lewes Gasworks, September 29th, 1828’ is in the permanent collection of the Science Museum, London. This picture was drawn on the day of the ascent and depicts the unusual sight of a hot air balloon over Cuilfail. Crowds had gathered on School Hill and were charged to see this. 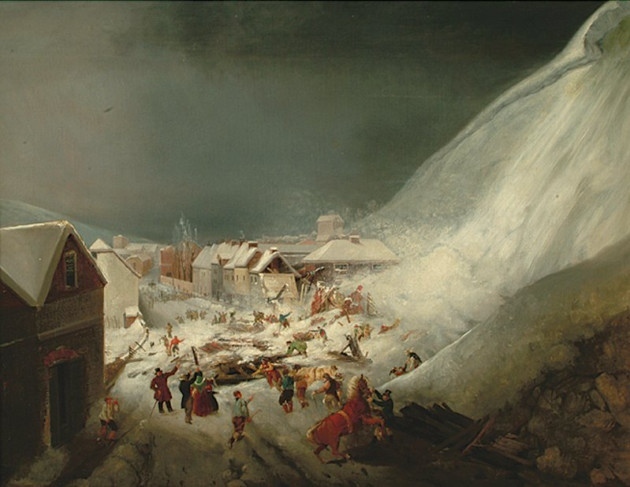 His painting of the Avalanche at Lewes 1836 is housed at Anne of Cleves’ House in Lewes. It depicts the tragedy that struck on 27 December 1836, the worst avalanche in Britain. A brutal winter had caused a huge build-up of snow on the side of Cliffe Hill, near the present Snowdrop Inn. Tons of snow fell down on the workers cottages at the foot of the hill killing 8 and destroying the cottages. The painting depicts the results of the avalanche and the brave locals leading the rescue attempts. A lithograph of ‘The Opening of the Railway in Eastbourne, 14th May 1849’, drawn and engraved by Henwood, is housed at the Science Museum, South Kensington, London. It depicts the celebration of the extension of the Brighton and South Coast line from Polegate to Eastbourne at the behest of the Earl of Burlington. The picture shows the first steam locomotive entering the new Eastbourne Station and the celebrations of the locals, including toasts, speeches and fireworks. Henwood’s painting, oil on canvass, of ‘A Rockfall at Seaford, Sussex, 1850’ was sold at Christie’s on May 10th 2006. It depicts the detonation of a section of Seaford Head chalk cliff in an attempt to tackle beach erosion. Some 10,000 spectators watched the operation led by Major General Sir J. Burgoyne, K.C.B., inspector of fortifications. He gave the signal for the explosion from the Martello Tower, visible in the picture. Special train services had been laid on from London to Brighton for the spectators, which included a young reporter, Charles Dickens. 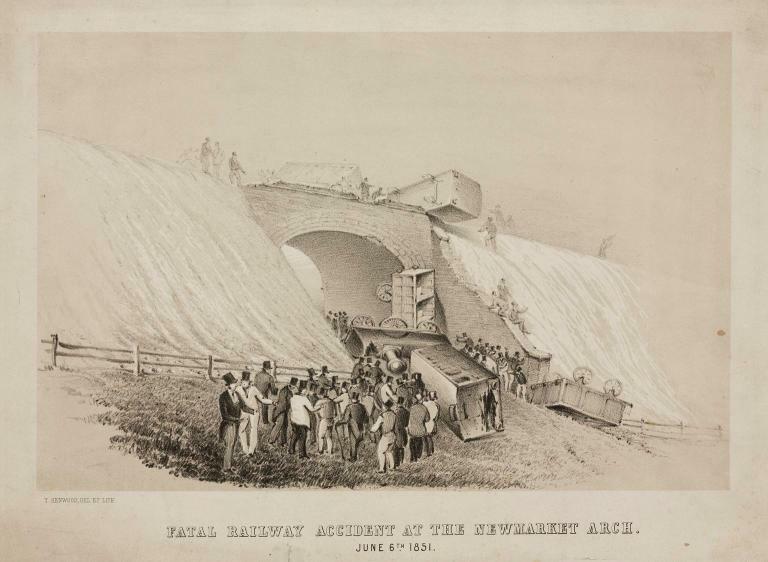 Henwood’s picture of ‘a Fatal Railway Accident at the Newmarket Arch, June 6th 1851’ records the falling of a train off the arch on the Brighton to Lewes line, where 4 were killed at the scene, including the stoker, and another later died from his injuries. The inquest was reported in the newspapers at the time. When the train hit a sleeper lying on the line and fell off the arch, one fortunate traveller Samuel Pavey, a young labourer, lay down and held on under his seat and survived the impact. 3 other passengers in his carriage were thrown and killed outright. The driver was taken from the wreckage barely alive and died after surgery to remove his leg. Although the finding of the inquest was that the accident was caused by “a wooden sleeper having been wilfully, feloniously and maliciously placed across the line by some person or persons unknown” there was evidence suggesting that the sleeper had been placed there by a 10 year old boy, James Boakes. He had been playing nearby and saw the crash. He demonstrated to the inquest jury that he could easily move a sleeper. The Railway Police Superintendent William Acton told the jury that the boy had admitted placing the sleeper over the rail to play see-saw. Tragically and extraordinarily, just over a year later on 7 September 1852, a violent storm hit Lewes. James Boakes was tending pigs with his brother in a field, when he was struck by lightning and killed. He was buried on 10t September 1852 at St Anne’s Church. Thomas Henwood’s lithograph of the crash scene is housed at the Science Museum. It shows the engine on its side at the bottom of the arch along with the tender and a carriage that had been thrown some distance. Another carriage is lying on its side, half over the wall at the top of the arch. A crowd of men in top hats have gathered to view the scene. Perhaps some were those 15 jurors and coroner and the various investigators and railway staff that attended soon after this tragedy. This entry was posted in Art & Architectural History, Economic History, Family History, Lewes, Local History, Uncategorized. Bookmark the permalink.